Radar images of asteroid 3122 Florence obtained at the 70-metre antenna at NASA’s Goldstone Deep Space Communications Complex between August 29 and September 1 have revealed that the asteroid has two small moons, and also confirmed that main asteroid Florence is about 4.5 km (2.8 miles) in size. Florence is only the third triple asteroid known in the near-Earth population out of more than 16,400 that have been discovered to date. 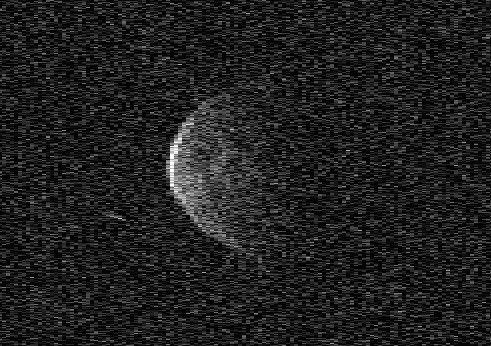 All three near-Earth asteroid triples have been discovered with radar observations and Florence is the first seen since two moons were discovered around asteroid 1994 CC in June 2009. The sizes of the two moons are not yet well known, but they are probably between 100 – 300 metres (300-1000 feet) across. The times required for each moon to revolve around Florence are also not yet known precisely but appear to be roughly 8 hours for the inner moon and 22 to 27 hours for the outer moon. The inner moon of the Florence system has the shortest orbital period of any of the moons of the 60 near-Earth asteroids known to have moons. In the Goldstone radar images, which have a resolution of 75 metres, the moons are only a few pixels in extent and do not reveal any detail. The radar images also provide our first close-up view of Florence itself. Although the asteroid is fairly round, it has a ridge along its equator, at least one large crater, two large flat regions, and numerous other small-scale topographic features. The images also confirm that Florence rotates once every 2.4 hours, a result that was determined previously from optical measurements of the asteroid’s brightness variations. The animated sequence to the left is built from a series of radar images of Florence. The sequence lasts several hours and shows more than two full rotations of the large, primary body. The moons can be clearly seen as they orbit the main body. Radar images are different from pictures taken with a digital camera but are similar to ultrasound images. The geometry in radar images is analogous to seeing an object from above its north pole with the illumination coming from the top. Projection effects can make the positions of Florence and its moons appear to overlap even though they are not touching. Florence reached its closest approach to Earth early on September 1 and is now slowly receding from our planet. Additional radar observations are scheduled at NASA’s Goldstone Solar System Radar in California and at the National Science Foundation’s Arecibo Observatory in Puerto Rico through September 8. These observations should show more surface detail on Florence and provide more precise estimates of the orbital periods of the two moons. Those results are valuable to scientists because they can be used to estimate the total mass and density of the asteroid. An animated view of asteroid Florence’s two moons is posted below.